The conservation organization European Wildlife obtained a herd of the first five wisents in Poland in the past days. Next year the animals will be released under the reintroduction project in Central Europe, specifically in the Czech Republic. The breeding group composed of one male and four females was obtained from Poland by European Wildlife via its local organization Czech Landscape on the basis of a agreement with the European Bison Friends Society. This international organization located in Poland coordinates wisent rescue and reintroduction programs within the whole Europe. „We are very glad we obtained the first wisent herd in the past days. This animal species is crucial for biodiversity within the whole Europe and of course it plays a key role also for our organization which has the majestic animal in the emblem,“ stated Dalibor Dostal, the director of European Wildlife. „I would like to thank for the cooperation to our friends from European Bison Friends Society and also to our sponsors who gave us funds for buying the first wisent herd,“ emphasized Dalibor Dostal. The funds were given by private companies, mainly the company Ekospol, by hundreds of people in the form of small gifts and a gift from children from American International School Vienna in Austria was also very significant. 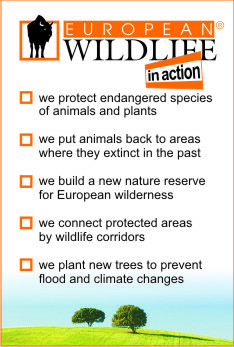 In the Czech Republic European Wildlife is preparing three projects focused on wisents in the nearest future. The founding of semi-wild breeding in two areas and the founding of free living population in one area. In the year of 2014 there should be added three more animals bought in Poland to the first five wisents. The wisent became a symbol of nature conservation in the whole Europe. After the first World War it was completely exterminated in wild nature. It survived only thanks to farming in captivity and an international rescue program. At present there live about 4,500 wisents in the world and about 3,000 animals of it in wild nature and semi-wild areas.